I’ve acquired this issue a number of times–out of its bag, with and without the bag, with and without one of the cards. But in all these years, I’d never gotten around to actually reading this this! In this particular case, I’m reading a bagless copy with a $2.50 cover price. We open on a couple of thugs beating a woman, and see her rescued by a guy in a purple and blue costume–an obvious vigilante figure. He claims he’s "hard to hurt," and he’s looking for someone called "The King." Though he takes a bad gunshot wound–with the original victim he rescued actually approaching him to help HIM–he gets up under his own power, proving what he said about being hard to hurt. The scene cuts to the so-called King, quite angry about the intervention of this Solitaire into his plans. We see and learn that he considers himself King Pleasure–if it feels good, DO it. 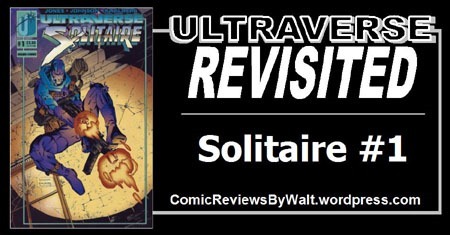 Back with Solitaire, we see the vigilante deliver the victim to safety while he continues tracking King’s men. We see that Solitaire’s HQ is in an old movie theater, that he’s good with computers, and he’s got an established network of people to help him with his crusade…and that he has issues with his father and isn’t surprised to learn that King Pleasure has some sort of tie to his Father. Solitaire puts a plan in motion, and is able to get into King Pleasure’s inner sanctum, rescue a couple of his captives, and END this King’s reign. We also see Solitaire reveal his identity to King…he is Nicholas Lone, son of the crime lord Anton Lone. While the King’s "palace" burns and the rescued victims watch, Solitaire speeds off in his car, brooding over his origin, silently vowing to himself that "this fight" has only just begun. In a way, this issue feels too quick and simplistic. But that’s (as often the case for me in 2018) most likely due to being trained for most of the last 17-some+ years to read stuff for the larger story, for the 6-issue "graphic novel," as it seems that modern comics have mostly lost the "art" of the single-issue story. 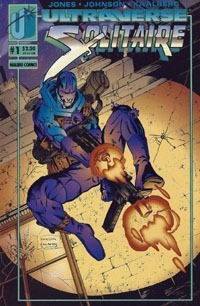 Though this is the premier issue of an ongoing/12-issue series (in 2018 I know this as a 12-issue finite series, but do not recall if it was originally intended as such or if it was intended as an open-ended ongoing series) it feels like it could be simply a one-shot, a single issue introducing a character, showing him off, introducing and resolving an immediate story, and leaving him to "the universe" to be used or not as any creators might choose. This works very well as a setup-issue, a foundation-laying issue. We meet the title character, see him in action, see what he’s about, see what he’s capable of, meet supporting characters/locations, see him resolve a case, and have a decently-proper sort of ending…all in one single issue. Which makes this great "pilot" for a series. I like the structure of the issue, the way this story is presented. In tandem with the art itself, this looks and feels like a ’90s comic in general. Visually, the art is good–though there seem to be panels where there’s some shortcutting going on, it’s nothing not seen elsewhere, and doesn’t detract from the story. One is easily able to read along and keep up with what’s going on, and there are some nice, dynamic layouts that move the story along fairly cinematically. Simply looking at the art, it doesn’t stand out to me in a "this is my favorite artist ever" sort of way, but it’s not bad, and I especially like the colors for Solitaire’s outfit! I’m very pleasantly surprised at how much this issue seems to work as a one-shot and "first issue" together. 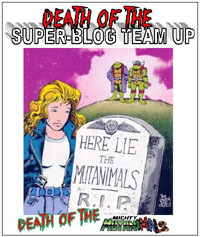 It’s very solid as a first issue, and on my first reading seems to be independent of all the other Ultraverse titles thus far, with no real reference to Ultras, other Ultras, and so on. Solitaire’s own "hard to hurt" nature reminds me a lot of the Bloodshot character from Valiant, and I’m interested to see how far those similarities go in future issues of this book. Buy this for the "bagged" gimmick, for the trading card…buy it because it’s a #1, buy it because you like the cover art, buy it for whatever reason…you don’t need previous issues, and there’s no actual "To Be Continued" and thus for this one-off issue you don’t even "need" any future issues–though the fact that there are later issues mean there’s more material for you to get if you liked this issue! Given the nature of the issue…I absolutely recommend it if you find it in a bargain bin (25-50 cents for sure, with the bag/card insert, certainly up to $1 or so!). It’s a good read, and as with many of the other Ultraverse titles, I’m curious and looking forward to reading additional issues.